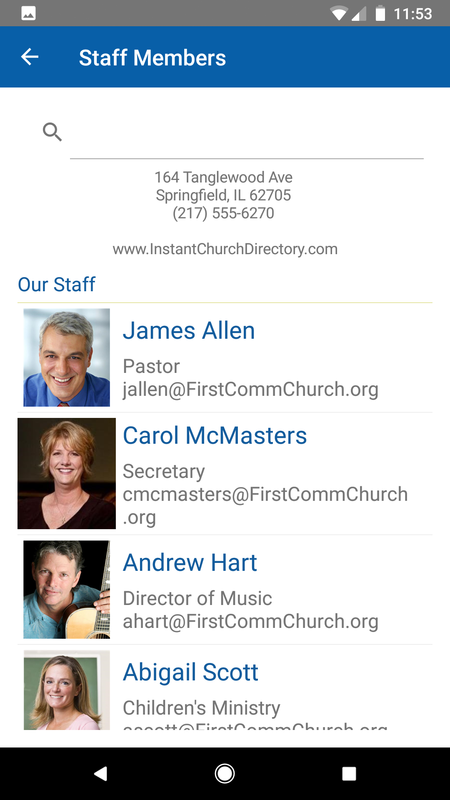 Instant Church Directory on your mobile device. Instantly. You’re worried about security and privacy, and so are we. Members have to register each device and directories can’t be shared. Further, only members you authorize can gain access and directories are automatically “wiped” from all their devices if you revoke access. Emailing your members is a great way to get the word out. Click here to see an example email. What's new with the Android App 2.0? 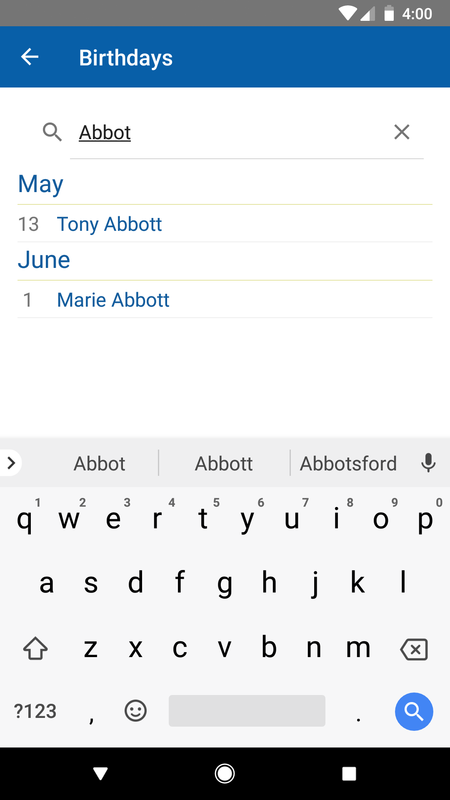 We've released an update for the Android App that includes Groups, Birthdays and a unified login process. 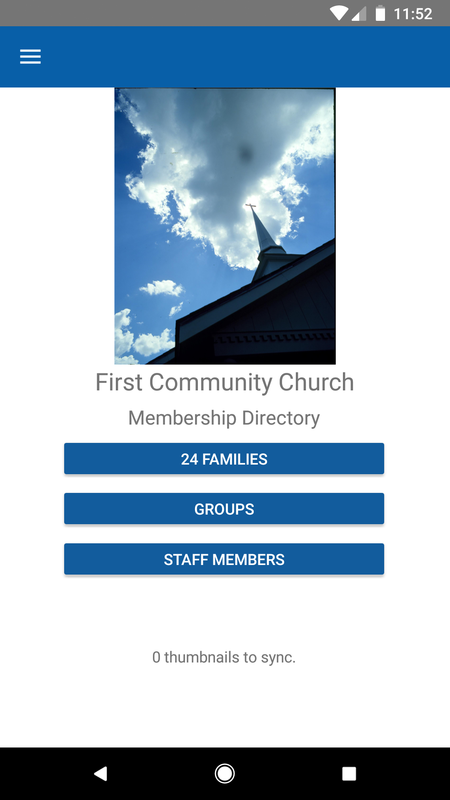 Create and use the password of their choice to sign into the Mobile Member App on any device and the Online Member Directory. This upgrade provides a unified login experience across all platforms and devices without sacrificing security. See below for information that will help you and your members. How do I send a text message or call another member from my ICD App? 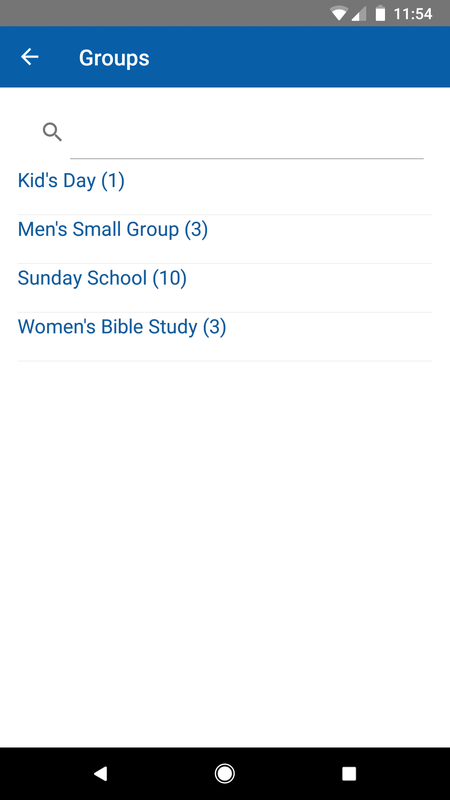 While you cannot send mass text messages through the app to the entire congregation, you can send another member within the app a personal text message from the App. This will act as a regular text message, so standard text plan costs will apply. Versions 8.3 or above – Simply press and hold on the phone number of the member you are wanting to text. This will allow you to either or call text that number. Versions prior to 8.3 – Simply click the phone number and a new text message window will appear. Will the password I use as the administrator work on the Member App or Online Member Directory? While the administrator login is different than the member login, you can opt to use the same password, if it is within the password requirements of at least 8 characters, one number and one capital letter. 1. Open the App and click on "Sign In." 2. On this page, click on "Forgot Password." 3. On the next page, enter your email address, as it is listed in the directory. Click "SUBMIT." 4. 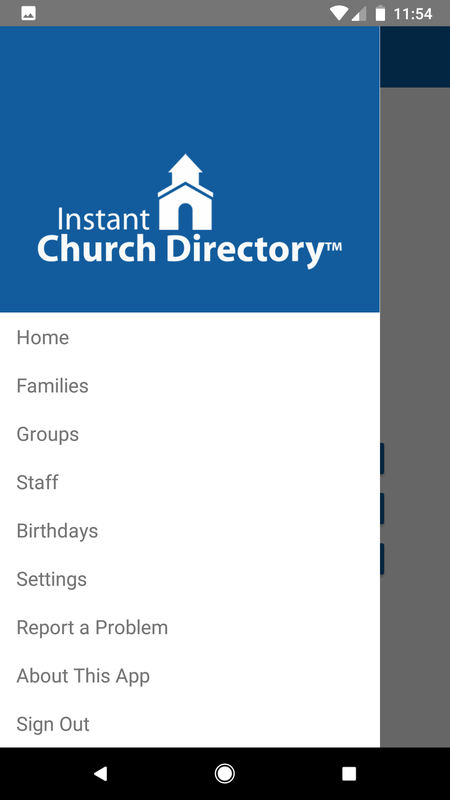 We will send you an email from service@instantchurchdirectory.com. 5. Click on the hyperlink within the email. 6. A page will open where you can enter and confirm your new password. (The password must be at least 8 characters and contain at least two of the following special characters: Capital Letters, Numbers or Symbols). 8. Return to the App and click on "Sign In". 9. 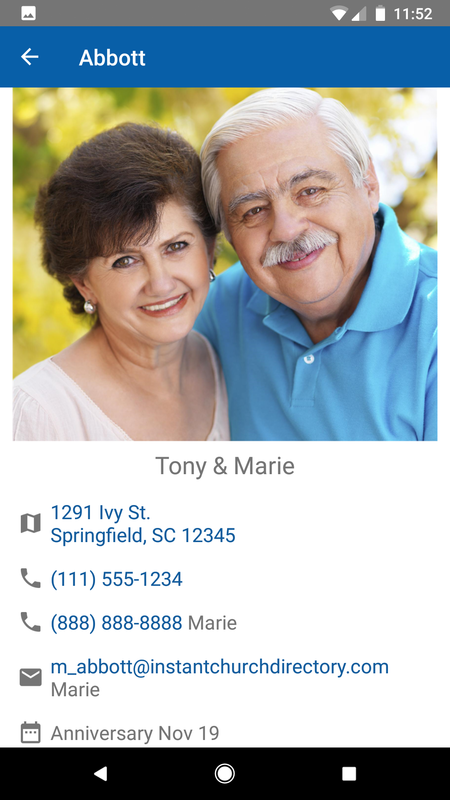 Enter the email address as it is listed in the family portion of the directory. 10. Enter your NEW password and click the sign in button. Once they have updated their password, it will now be the password they use for all login purposes, both the Online Member Directory and any Member App. How does a member sign into the Member App on an Android? NEW MEMBER - Android & Kindle Devices (Version 2.0 or Newer) The instructions below are for members who have downloaded the App and are creating a login for the very first time. If you have previously logged in to your church’s directory and upgraded your app, please follow the ALREADY HAVE A PASSWORD instructions below. 2. Open the app and click on "Create Login". 3. Enter the email address as it is listed in the family portion of the directory. 5. Retype your password to confirm. 6. 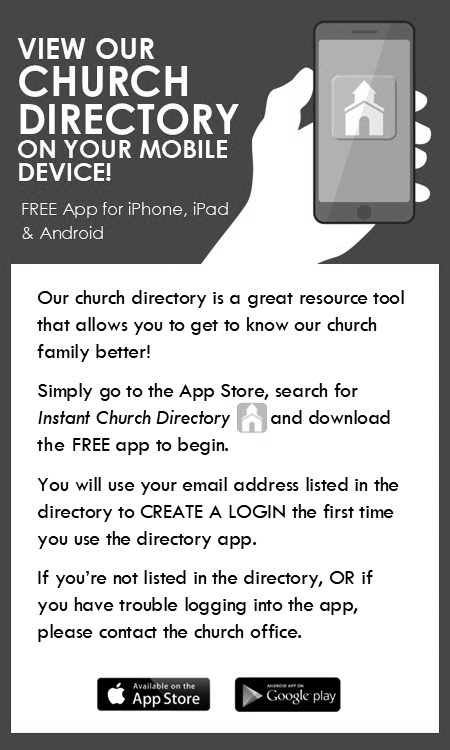 Check your inbox for an email from service@instantchurchdirectory.com. 1. Open the app and click on "Sign In". 2. Enter the email address as it is listed in the family portion of the directory. 3. Enter your password and click the sign in button. If you do not remember your password or the password we supplied you in the past, please select “Forgot Password” and follow the instructions to reset your password. 3. 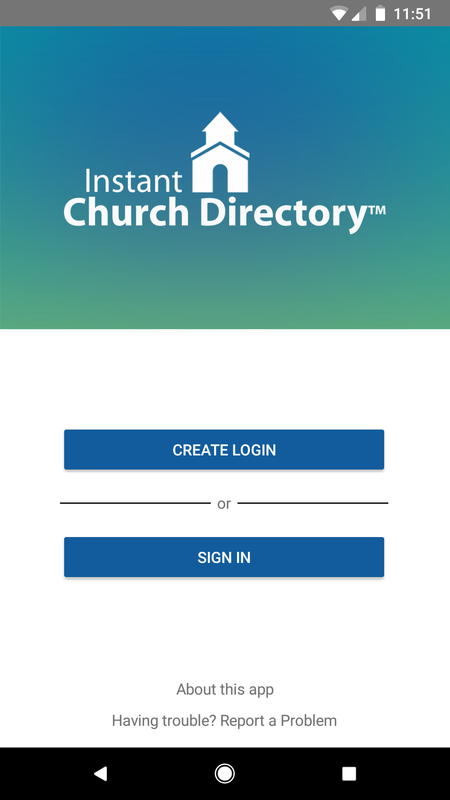 Check your inbox for an email from service@instantchurchdirectory.com. should be entered as a zero. How does a member sign into the Member App on the iPhone/iPad? 2. Open the app. Click on "Create Login". 2. Enter the email address as it is listed in the family portion of the directory. 3. Enter your password and click the sign in button. 3. Retype the password to confirm it. Why aren't my updates showing on the Mobile Apps and Online Directory? The app will automatically sync any updates made in the Admin site at least once an hour. Sometimes sooner depending on what you are doing in the app. 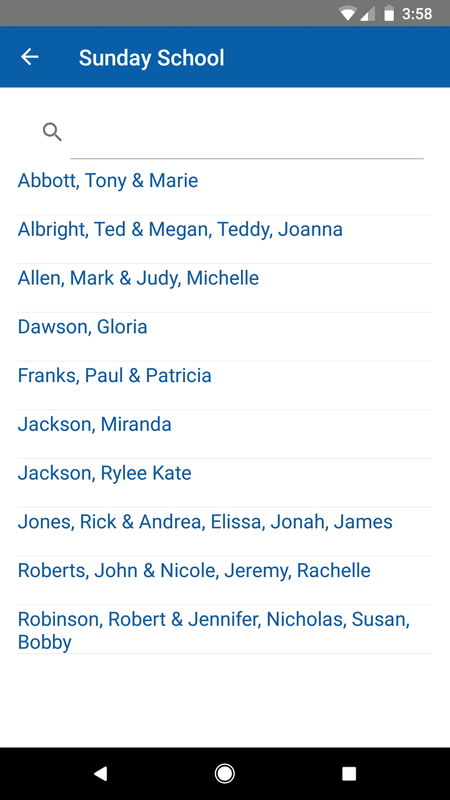 Anytime you want to see an update you've made in the Admin site immediately, you can hit the circular refresh arrow in the upper right on the Families list view in the app and any changes you've made will sync to your device right then. Images take a little longer to sync than text only changes and is dependent on your internet connection speed. How do I email/call/text other members directly from the app on iOS devices? Sending emails and texts through the app is easy. 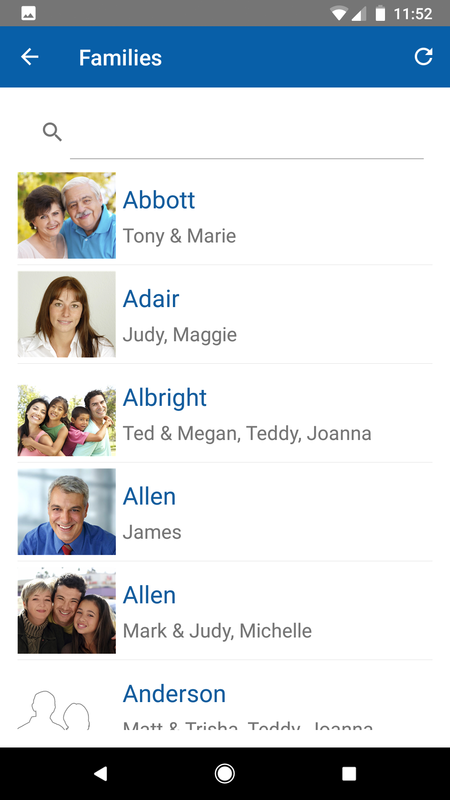 First, open the app and click on ‘Families’. With the new update released for the Member App on Apple devices, instead of pressing and holding on the email address/phone number, you will now simply click. By clicking the email address it will open an new email to that address. By clicking the phone number normally, it will now give you the option to either call or message the number. If you press and hold either the email address or phone number, it will simply copy the email address/phone number to the clip-board on your phone. Logging Into The Member App from Communication Resources, Inc. on Vimeo. Copy and paste the text above.